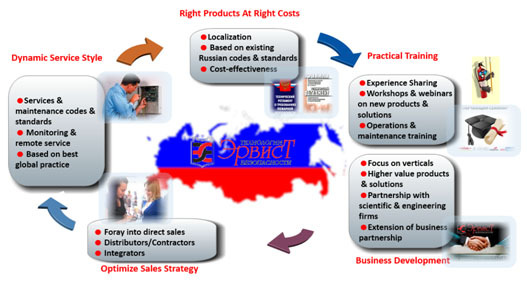 Our operations in the Russian market stem from our fundamental belief in entrepreneurial leadership and creative business development techniques. We always begin by looking at requirements of the Customer, no matter what type the Customer is. We examine the market through our Ervist Prism to gain an understanding of its basic requirements and try exploit all existing technologies and techniques both intrinsically Russian and global. Only with such approach does it become clear how to best structure initial technological effort that culminates in sales of best solutions. The greatest results can only be achieved through simplicity of principle and a solid vision. Our suggestions are custom tailored and unique for each of our Customer. Ervist Group brings a rich combination of seasoned market experts and technical knowledge to provide these kinds of services. We are capable of providing a wide range and depth of resources to address today's most critical marketing issues. We invite you to read more about our various sales and marketing service lines in other Web-site pages.